The VWR 5L water bath is a reliable workhorse for your lab. This sturdily constructed water bath is built from corrosion and scratch resistant powder coated steel, with a non-reactive, 5 liter, stainless steel interior bath complete with a sample tray to allow for full uniform circulation. The acrylic gabled lid helps this waterbath to reach and maintain temperature with a port for an external thermometer. The VWR 5L water bath is controlled through a low profile, easy to reach analog turn knob. The temperature range of the VWR Scientific 5L water bath is ambient +5° to 100°C with a uniformity of ±0.2°C at 37 for reliable, reproducible results. 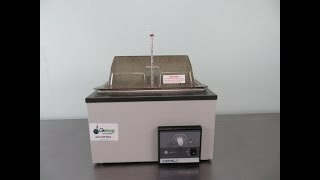 This VWR 5L Water Bath has been thoroughly inspected and reached it's maximum temperature. All of our lab equipment comes backed with our standard warranty. Should you have questions about this or any of our other water baths, please don't hesitate to call, we have a wide selection to chose from!